It’s 2016, everyone! Happy New Year, I hope you all feel as fantastic as I do today. I look back on 2015 with fond memories. Suited, booted and with a rather fetching champagne sorbet twinkling on the table at which I sat, I ushered the big two-zero-one-five in alongside 15 wealthy Swedes in Gothenburg. There was etiquette, there was sophistication, there was snow and there was, on my part, a hell of a lot of anxiety. It was incredibly Swedish, but not really my bag. This year, although I’ll be returning to Stockholm in a couple of weeks, I felt 2016 deserved a more Mancunian welcome. With that in mind, there was alcohol, horrific dancing, no etiquette, no sophistication and more alcohol last night. But it was top, despite this morning being an epic struggle. I’m Still Standing, though, and I write this with the hope that 2016 means ‘new year, new me’ for Manchester City who cannot afford to Sacrifice further ground in the race for the Premier League title. It’ll certainly be a ‘sad, sad situation’ if we do slip up again, so ‘Don’t Go Breaking My Heart’, Blues! 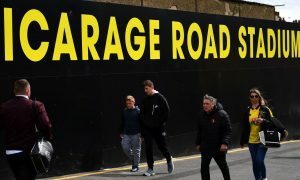 Next up, it’s Elton John’s beloved Watford at Vicarage Road. Not the best place to try and apply a lick of paint to a shabby away record, I’ve got to say. It’s not that the Hornets have a particularly great home record – they’ve lost four of their ten games on their own turf this term – but their front two really do know how to sting. Odion Ighalo has been scoring with more frequency than notorious gigolo Porfirio “Rubi” Rubirosa (anything to get that rhyme in there) this season – he’s scored 7 goals in Watford’s last 8 home games and 14 in total – and will be a real handful for us tomorrow. Troy Deeney, his strike partner, can also cause problems. He’s a proper brute of a player, but possesses excellent technical ability and often comes deep to collect the ball and provide for his Nigerian pal. Between them, the pair have 20 league goals and make up one of the most fearsome attacking lines in the division. As disappointing as it was, we can take some confidence from that 0-0 draw against Leicester going into tomorrow’s game. Otamendi and Mangala were solid and we recorded our first league clean sheet of the season without Vinny in the side. I suppose it’s pretty embarrassing that we look at that as some sort of achievement, but Manchester City conceding goals has been an easy bet and we need the pair to really step up in the captain’s absence this year. On another positive note, Fabian Delph and Gaël Clichy have returned to the side after picking up slight knocks earlier in the week and Zaba has said that his knee “feels really good”. I can already see the stars aligning for us. I’m going for a 2-1 win. Let’s be positive, eh?